The feathered menaces have been keeping residents in New Elgin awake in the early hours while leaving unsightly mess and swooping at walkers. Now it has been revealed that visitors to the town have fled the area in an attempt to escape the problem birds. Kate Elliott and her husband William, from Ballycastle in Northern Ireland, left New Elgin at the weekend after halving their stay in the town, which was timed to coincide with their 40th wedding anniversary. Mrs Elliot praised the town and the region for its attractions – but warned she would no longer recommend it to tourists considering a visit. She said: “My husband is a farmer so it’s not like we’re not used to the birds being around. “It was just awful though. We weren’t getting any sleep, the noise was just unbearable. After a few days of walking round like zombies we decided we couldn’t take it anymore. Meanwhile, residents in New Elgin have banded together in an attempt to persuade authorities to draw up an action plan to curb the influx of the gulls. Parents have stopped children playing in gardens, walkers have had food snatched from their hands and locals have been forced to duck to avoid the dive-bombing birds. Robertson Drive resident Elaine Chapman believes it is time that rules surrounding the protected species should now be reviewed. The care worker said: “I try and chase them away with a broom. There’s nothing else I can do. There needs to be a cull but you’re not allowed to touch them. Moray MSP Richard Lochhead has now written to Moray Council to ask what action can be taken to control the birds. Yesterday the local authority explained there were no plans in place beyond removing nests on council-owned buildings when requested. Battling gulls has been an age-old problems for residents across the north-east. A variety of methods have been used in an effort to fight back against the menaces – which earlier this year were caught on camera lifting food from supermarket trollies. Lasers have been used in Elgin throughout the summer as part of a trial by the business improvement district to encourage the wild birds to leave the town centre. Officials have already approved bringing back the light technology next year to continue the fight. In Peterhead, meanwhile, streets were closed to allow a crane to be used to remove nests and eggs from rooftops. 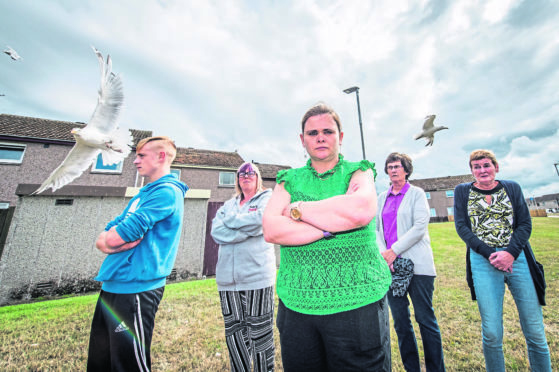 And residents in Aberdeen’s Seafield Crescent and Viewfield Avenue have claimed the community is being terrorised by a gang of 20 “permanent” birds. Councils are not legally obliged to take action against gulls, which are a protected species. However, signs have been put up across the north-east to discourage people from feeding them. Moray Council has ruled out taking action against the birds on cost grounds while they attempt to balance their budgets. Scottish Natural Heritage issues licences to kill the birds or destroy their eggs – but only when there is no suitable alternative. The RSPB has questioned the success of nest destruction or egg-oiling because populations of urban gulls are continuing to rise. Officials have recommended making nest sites inaccessible and reducing street litter as the best way to control them.